Losing belly fat is good for your health. Many women carry excess weight in the belly area. You probably don't like the way this looks, but too much fat around your middle also increases your risk of several health conditions, including heart disease, cancer and diabetes. You don't have to resign yourself to the same boring workout day after day to achieve results, though. Cardiovascular exercise is the best choice for burning fat and dropping unwanted weight, which gives you plenty of options. Cardiovascular exercise burns calories, which is what makes it so vital to a weight-loss routine. You can't target your belly fat with exercise, but a consistent routine helps you lose weight all over your body. The best choice for you is one that you enjoy because if you don't like exercise, you're less likely to stick with it until you reach your goals. The more calories you burn, the quicker you'll lose weight. 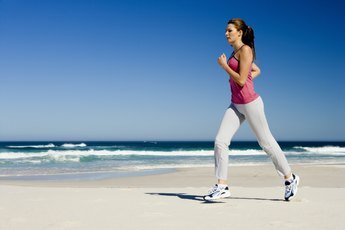 For example, walking burns 200 to 300 calories per hour, but running can burn more than 1,000 calories in an hour. Other good choices include dancing, swimming, biking, basketball and soccer. The Centers for Disease Control and Prevention recommend 150 minutes of cardiovascular exercise each week for weight control. This means you'll need to increase your exercise time to as much as 300 minutes per week for effective belly fat loss. Spread this time out throughout the week to keep your metabolism going. For example, exercise for one hour, five days per week, rather than blocking out two or three longer sessions. 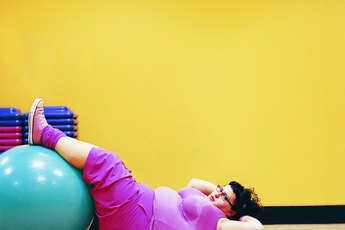 Interval training increases your calorie burn, according to MayoClinic.com. This is good news for you because you can burn more calories in a shorter amount of time, perfect for women with busy schedules. Interval training involves alternating moderate speeds with vigorous speeds through your workout. For example, instead of walking at the same pace for one hour, walk at a moderate speed for three minutes, then walk briskly or jog for one minute. Switch back and forth for 45 minutes. Intervals work well for swimming, biking and aerobics routines as well. Strength training isn't as effective for weight loss as cardiovascular exercise, though you'll still burn some calories. What it is good for is toning your belly muscles. Once you lose excess fat, exercises that target your abs help define the muscles, making you look slimmer and healthier. Strength training also builds lean muscle mass, which boosts your metabolism. Planks, crunches, situps and any moves that require balance are good options for working your belly.